Are You (or Your Kids) Suffering from Text Neck? Next time your kids are on their devices, take a look at their posture. Look at how far forward flexed their necks are. Look at their rounded shoulders. Then take a look in the mirror the next time you are texting on your phone. Not a pretty sight, is it? These overused devices are putting undue stress on your spine and nervous system affecting the structure, function, and physiology of your body. The spine is made up of 24 vertebrae. When positioned and functioning properly, the spine is designed to resist the heaviest of loads. Take away the ideal position combined with repetitive static loads and the spine becomes weakened and subject to premature wearing, pain, and stiffness. The compromised tissue structure over time will increase our susceptibility to sudden injury and even sickness. *The study assessed the forces placed on the spine as the head is tilted forward into worsening posture. 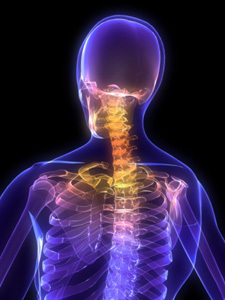 *The weight added to the spine dramatically increases when flexing for varying degrees: 0° increased weight on the neck by 10 to 12 pounds; 15° increased weight on the neck by 27 pounds; 30° increased the weight on the neck by 40 pounds; 45° increased the weight on the neck by 49 pounds; and 60° increased the weight on the neck by 60 pounds. *Loss of the natural curve of the cervical spine leads to incrementally increased stresses about the cervical spine. The stresses may lead to early wear, tear, degeneration, and possibly surgeries. *Good posture is defined as ears aligned with the shoulders and shoulders retracted. With proper alignment, spinal stress is diminished. *Good posture was associated with much more than just bad backs or bad necks. Good posture helped increase good hormones. Good posture was linked to increased testosterone, increased serotonin, decreased cortisol, and increased feelings of power. Poor posture is associated with reduced testosterone, reduced serotonin, increased cortisol, and reduced feelings of power. *Poor posture occurs with the head in a tilted forward position and the shoulders drooping forward in a rounded position. *An average person spends 2 to 4 hours a day with their heads tilted forward for reading and texting on their smart phones, amassing 700 to 1400 hours of excess, abnormal cervical spine stress per year. It was also noted that a high school student may even spend an extra 5000 hours in poor posture per year! Sound like anyone you know? Beyond spinal and muscle injuries, improper posture influences all aspect of human performance through the endocrine system. As evidenced through this research, poor posture negatively influences levels of testosterone, serotonin, cortisol, and feelings of power. As technology continues to govern more and more of societal functions, the need for practitioners who positively influence posture increases. Unfortunately, most of society still believes that poor posture is more of a cosmetic issue than a health issue. Because of this, awareness and education is the key to making change. How do you know if you or your kids are suffering the ill effects of text neck? Have the proper tests done. If you haven’t had your children in for a check-up, perhaps now is a good time to get it done. Chiropractors are key leaders in improving quality and longevity of life by improving health and function through postural alignment. This is one of the reasons we focus on the structure of your spine through structural radiographs and structural imaging. Reference: Surgical Technology International Journal 2014 Nov;25: 277-9. Hansraj, KK. To learn more about Elevate Chiropractic and our dedicated team of professionals, click here.